Fast and sensitive THz receivers for far and mid - infrared wave range (THz region). Upgrade is available for any of your SSPD or THz system. We have been always hard working to expand the range of products with higher & better specs. Cryostats and cryogenic equipment for low-temperature experiments: closed-cycle cryogen-free and for standard Liquid He dewars. Sub-Kelvin (T = 0.8K) cryostats. We introduce a new line of our products: cryogen-free and LHe cryostats for low-temperature experiments. 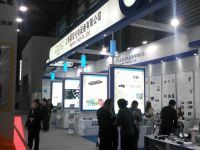 Scontel has participated at the famous exhibition "Laser World of Photonics China". There was the booth with our representative - Aunion Tech Ltd. It was delicious.